How Do I Get People to Convert? Let’s define your funnel now. You can have two goals on Quora: Creating awareness and generating traffic. These two aren’t mutually exclusive, so you should try to be memorable in any case. One single answer often won’t sell, or worse, won’t even get the reader to click a link in your answer, even if they like what they read. Marketers often say that you need seven touch-points to get someone to convert. If your readers remember your answers, they are much more likely to convert, because they already saw your content multiple times. If they don’t need your solution now, they should still remember you for when they might do. You should be the one they think about when they have a problem you solve. You should give them ways to find you when they don’t read your answer. Make one thing about you easily memorable. Make sure that when they think about you later, they know where to find you. “Every funnel has a beginning and an end. At the beginning, we have the largest amount of people who never heard of our product. At the end, we have the smallest number — all the people on the planet who bought our product. So, a graphical representation of a perfect funnel is a pipe that is the same diameter in the beginning and in the end. This means that 100% of the people bought your product. And the best of the best funnels is a never-ending pipe. That means people always come back again and again to pay for your product. Let’s start with your goal: If you want people to convert, you need them to click a link somewhere. That could be in your answer or on your profile. They could potentially also copy information from your topic bio. You can’t have a link in your topic bio. How do they get to the link? Why would they click it? To receive targeted traffic, you should focus on collecting your views from question-pages that show your answers. So, to receive many views, you’ll have to choose the right questions and write good answers. These two have their own sections in this book. To get people to convert further, they’ll have to click a link. But that’s not where their journey ends. You also have to be very careful about where you send them. If you want them to become a customer, you’ll want to send them to a page that lets them convert. The page you’re sending them to should also be relevant to the Quora question. Traffic from Quora is so great because it allows you to personalize your website. You do not only know that they come from Quora, but what problem they are having specifically. The funnel makes it obvious that you should choose questions with a lot of traffic, while making sure that you can rank high enough. You often have to find a good balance between those two. The rest only depends on your answer (and topic bio). 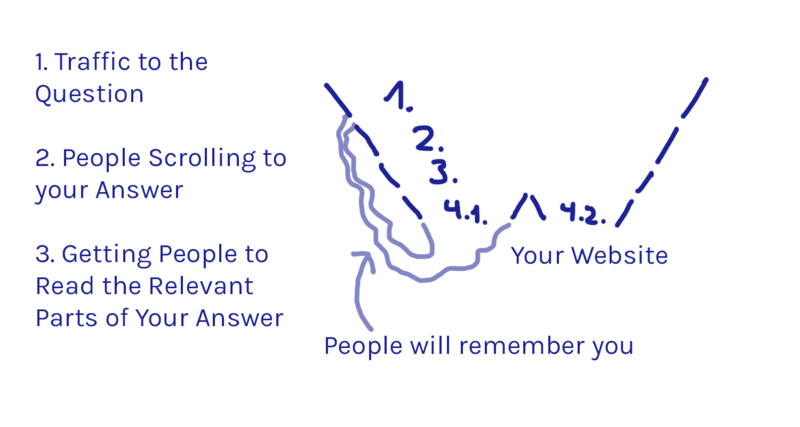 You should get people to read your answer, remember you, so that they are more likely to read future answers, and get them to click through to your website. You shouldn’t stop there. Think about your entire marketing strategy and how you incorporate Quora. The most difficult thing is to get them to click the link. The main factor to achieve this is to write good content. I can’t help you too much with that. You have to understand your potential customers’ needs. I’ll give you more tips on the style you’ll want to write in on Quora later in this book. In general, sell very soft. Just because you know that someone is searching for a solution to a problem, it doesn’t mean that you should instantly pitch your product. Get warm first. Don’t ask for much. The opinions about this are all over the place. Some say that you should mention your business at the end of every answer and only at the end of the answer. I wouldn’t completely agree with that. I think that you should only do that if you don’t have any other relevant sites to link to. You should try to spread the links in your text in a natural manner. Don’t use too many. Depending on what you’re trying to sell, people will not sign up to your product after having read one answer. That’s why it’s often a good idea to send them to a blog post of yours instead of just to your homepage. It’s also a good idea to combine Quora marketing with email marketing. Your answer might not be enough to get them to sign up, but it might be enough to get their email. You can increase the chance of getting emails by offering something in return, a lead magnet. Wherever you send people coming from Quora, be conscious about it. Quora marketing should be a part of your marketing plan, not something separate.